She was a victim of domestic violence. It’s a dark episode of her life which she still constantly recall not because she hasn’t moved on from the experience yet. It’s a personal battle, a choice to create awareness and share her experience with people who might be in the same situation. Lady cop Mary Chris Abacahin Camacho is vying for the Mrs. Philippines Asia-Pacific crown. the pageant will be held tomorrow, Feb. 3. Now, Senior Police Officer 1 Mary Chris Abacahin Camacho is raising her voice to break the cycle of violence. “I had to end the relationship because my children were already affected. That painful episode of my life thought me so many things. And I am sharing them now with other women who are or might be in the same situation,” the lady cop told Manila Standard in an interview. SPO1 Camacho revealed her husband’s being abusive and irresponsible as the cause of their union’s break up. This painful lesson as a separated wife has made her stronger as a person and which she will use to rally for her advocacy in the 2019 Mrs. Philippines Asia-Pacific search under its National Director Mitzi Go-Gil, Grand Winner of Mrs. Asia Pacific Tourism 2018. 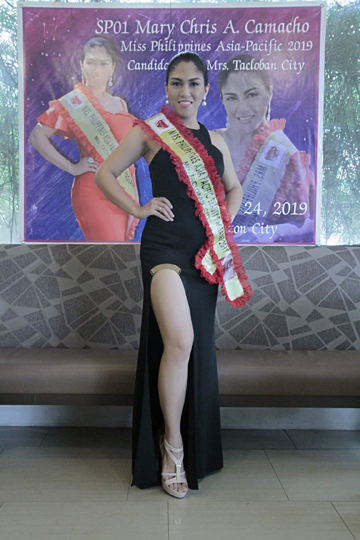 Camacho is one of the official candidates at 2019 Mrs. Philippines Asia-Pacific beauty pageant to be held tomorrow, Feb. 3, at Preston International Event Center, BGC, Taguig City. This mother of two is the first married woman of the Philippine National Police to join a national beauty search. Camacho is 40 years of age, stands 5-feet-5 and has been working as Crame-based liaison officer for four years. She is assigned at PRO 8, Logistics Division. SPO1 Camacho got separated from his husband and raised in her custody their two growing up sons. This gutsy, strong-willed beauty from Pagadian City persevered and entered the PNP, graduating with the Class Panangga of 2005. She is a graduate of Elementary Education degree and is a practicing Teacher when she decided to become a policewoman. She has reared singlehandedly her oldest son through college as IT graduate and, her other son, soon to follow with a degree in HRM. SPO1 Camacho will be talking from experience to be an inspiration to women who are suffering and are victims of similar abuse she endured as a wife and mother. She strongly believed that women have equal rights as men and are capable to do what they want to do in life, that nothing is impossible to follow and fulfill their dreams. “I’m doing this not just for my self. I think I can raise more awareness by joining this pageant. I am proud that I make a difference while performing my task as a member of the police force. But there are victims of violence out there that we haven’t reached yet. And my advocacy, with Mrs. Philippines Asia-Pacific Beauty Pageant, hopefully I can raise more awareness and share my experience to inspire other women to step forward and break the cycle of violence,” she shared. To support SPO1 Mary Chris’ journey in the 2019 Mrs. Philippine Asia-Pacific pageant, you log on to the Mrs. Philippines Asia-Pacific Beauty Pageant webpage and follow the steps to vote. She is #17 representing Tacloban City.